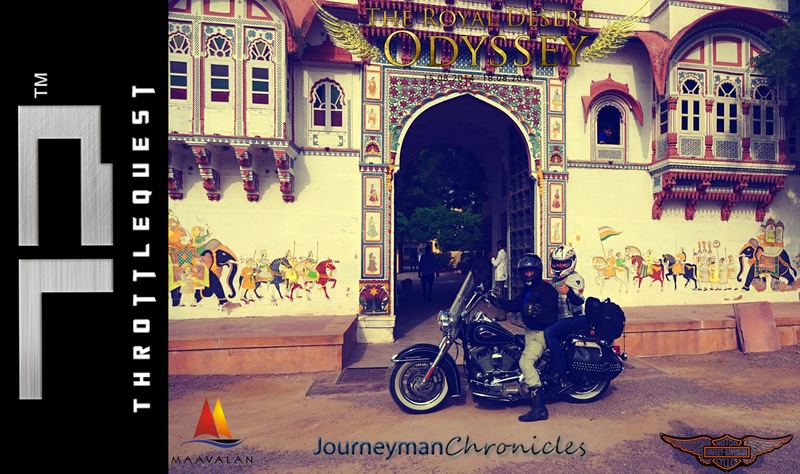 We spent this day discovering various places in and around Deogarh Palace, moments of riding with the Heritage Softail. This is the day, His Majesty gets one on one personal with the King size motorcycle! There were amazing moments of discussing motorcycles with Veerbhadra Singh, the King of Deogarh, visiting the esteemed Royal family in their private home. Chasing the nature in such pristine areas is something that you can do endlessly. And with each village that you cross, people look at the Heritage Softail with awe, children come running at you with wonderment in their eyes and you take a break near a small lake or under a tree and look at the winding road ahead. You just sit down next to your motorcycle and do nothing. Contemplation and motorcycling go together often. Royalty astride the Heritage Softail at the unique location: His Palace! 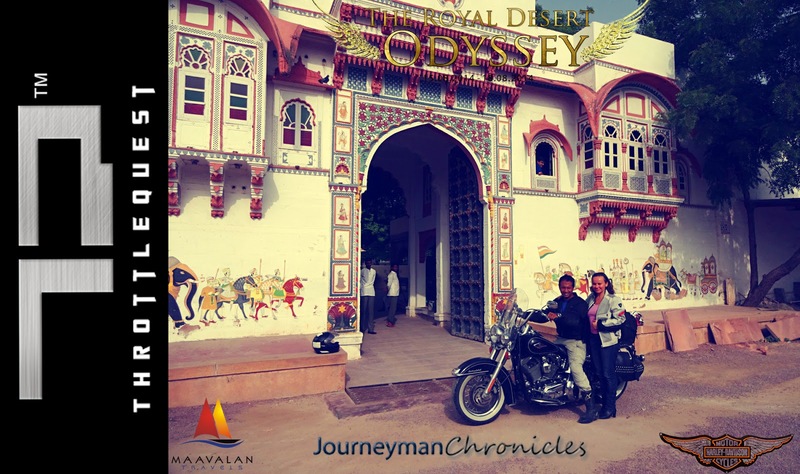 Later during the day we went to meet Veerbhadra Singh, the King of Deogarh who took the Heritage Softail out for a spin. His son is particularly fond of the Heritage Softail. However Veerbhadra himself seemed more fond of the Road King than the Softail. I told him maybe next time. Probably it has got something to do with the name! We talked motorcycles endlessly. At the King's personal residence! Veerbhadra Singh at his Royal Farms! We went to examine his vintage collection. He has got a Jaguar, a Desoto, a Dodge, several wartime Japanese Nissans trucks and in motorcycles, a BSA 650, an RD350, one of the first ever Lambrettas and so on! Among the newer generation bikes, he owns the Comet 250 and the Duke200 and is probably planning for a Harley… maybe the 48 he says. Smart choice I said to myself! He could talk automobiles for the rest of his life and I could listen to him for the rest of my life. The Royal life has a seemingly relaxed attitude about it. There was no rush. We chatted for hours with a beer in hand in front of the Majestic Harley! Absolute Beauties from The Royal Deogarh Vintage collection! And as time flew, the day came to a close. We had another long ride the following day. Veerbhadra explained to me a very picturesque path to get to our next palatial destination without taking the boring long highways. Instead he told us to take the narrow paths through the villages which would be far more interesting than the 4 lane interstate highways. And just in case we got lost in the myriad paths of the Aravali ranges, I had my Nokia navigator to guide us! Motorcycling is also about stopping to enjoy serenity! We had a lovely single malt to call it a day! Talk about lifestyles! The Heritage parked in front of the Palace Façade. That is about as powerful and as imposing as a Giant Railroad Locomotive! Leaving behind such a palatial luxury and such a unique experience does touch you with a hint of melancholia. But we were back on the Softail and we were headed towards yet another palatial experience curving along beautiful roads that took us through picturesque landscapes dotted with innumerable small villages for the next 200 kilometres. It was not a hard ride. Roads were good but not always very broad and straight. We were taking it easy soaking in the nature; herds of goats, herds of sheep encountered on the way, cows running at a brisk gallop with unbridled joy across fields pretending to be wild horses. Beautiful Heritage of the Harley. About 30 kilometres from our destination we hit an interstate highway. Our pace became brisk and we were doing 140 clips till the time we hit a road loaded with pilgrims on foot and on bikes. We were forced to slow down seeing the hundreds and thousands of pilgrims headed towards a place near Jaisalmer called Ramdeora. This is where one realises the extent of motorcycle use in India. Of course these were not premium bikers with good safety gear. Heck, most of these guys were even loath to wear helmets and at times they were riding 4 adults on one poor bike with a tiny 100cc engine struggling to generate 7.5 horsepower at the crank! But these bikers were enthusiastic. They were riding with groups of ten or twenty or even thirty. They were organised. They were not over speeding at any moment. They did not pretend to be racers the moment they saw my massive motorcycle which is usually the case in cities like Delhi! They just waved and smiled at me. These bikers were in their own world and they were focussed in their riding towards their destination and their own activities. Around noon, we reached Rohet. 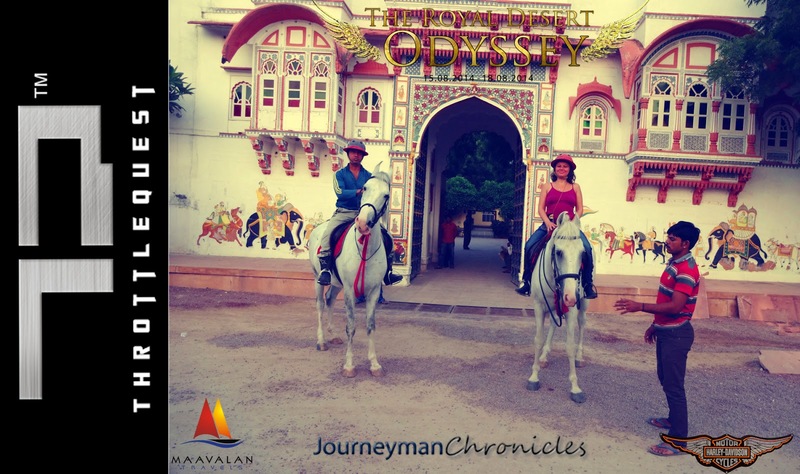 The Palace where we had been booked by Maavalan Travels Pvt Ltd is called Rohet Garh. It is owned and run by another friend of mine Sidharth Singh. This Manor/Palace is visually not as big and massive as the Deogarh Palace. But this is a boutique property that I simply love. And as I rode in with the Heritage Softail, once again I felt that it fits perfectly in its surroundings. The eye for detail, the subtle understated luxury, refinement of the paintings in the rooms, the under manicured gardens but just perfectly done; the Harley Heritage felt at home in a place like this. Arriving at the Gorgeous Rohet Garh! Unfortunately my friend Sidharth was not present to be able to enjoy the bike that I had got from HD India. Maybe next time. These guys have busy schedules, engaging lifestyles and a 4x4 in the garage. Maybe it is time for a lifestyle motorcycle! Just for the record, Sidharth is an amazing rider, I am talking about “real” riding here; real horses! Rohet Garh possesses one of the finest stables in all of Rajasthan adorned with some of the best Marwari horses that you will ever see. And you should see this man ride. When he is in Rohet, he NEVER misses a day of riding all through his life. And riding is one thing that I always do whenever I go to Rohet. It is such a pleasure. This is what the Royal lifestyle is all about; live in a palace, have a fine stable of 16 finely bred horses that can play polo or gallop at a fair pace, have a collection of over a 1000 bottles of fine wine, eat delicacies that need spice detailing the way you would do a minute paintjob on your tank, have 34 rooms with delicate paintings in them that never let you forget luxury and beauty often go together and if you want to know one or the other, you must develop a taste for it. These are not mere parameters. These are deep underlying elements that go to define personality, lifestyle with subtle undertones of Royalty and Heritage. My Harley fit in perfectly in this process. I wish my tank had a fabulous paintjob in 3D defining the mood of history, refinement and pride! 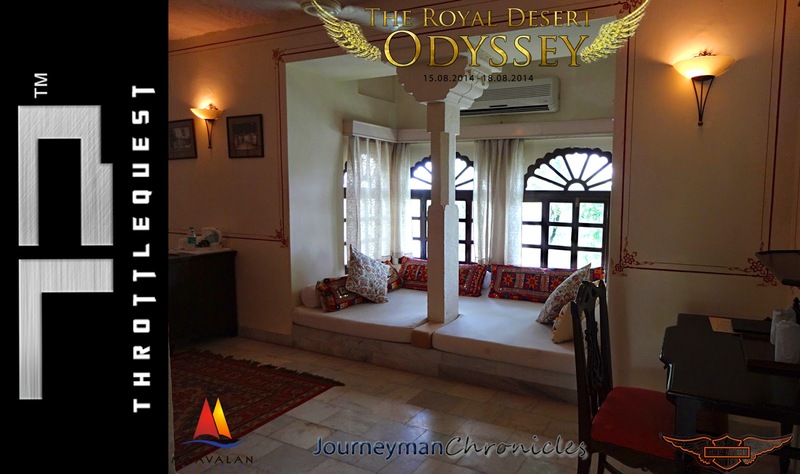 Room Decor of the Rohet Garh spelt out Refinement in every sense of the term! Afternoon was spent doing a long drive, this time visiting Bishnoï villages and participating in cult traditional opium ceremonies. It is one of the most interesting traditions of this area that you must absolutely see and participate in. How I wish I could have taken the Heritage Softail. But 90% of the drive was in a 4x4 in off road terrain and through bushes and some wildlife, the way kings used to live and hunt. Dinner was a sumptuous affair matching with the King’s lifestyles. It has got nothing to do with the amount or quantity. It is the research of the refinement in developing a taste that truly befits a heritage lifestyle. If you eat food like this, you will remember talking to the chef and discussing cuisine. Every aspect is thoroughly studied and then meticulously executed. Early morning ride, this time on Marwari horses. We were up and about playing on the horses at daybreak. What a start to a Royal morning! I knew I was going to get aches and pains the next day. But hey, what the heck; I was going to make the most of this ride before taking off on the Softail. After breakfast we were on our way back to New Delhi. Today was going to be one long day. I was going to stick to the Highways today. I had more than 600kms ahead of me. And that is a long haul by Indian standards. We left at 0900 hours. My wife and I were getting late for a wedding! Though, this time we were truly loath to leave this amazing journey behind us. Once again today the Nokia navigator stood us in good stead. Else we would be circling our way around Jodhpur and lose precious time. It was a long ride. We took two petrol bunk breaks and one lunch halt. Time was flying by and so were the miles. For those who think that the Heritage cannot do long hauls have been proved wrong today. And we did this in utmost comfort. My wife even did a scheduled Skype call sitting pillion during the ride! Speaks volumes about the comfort level built into this bike. If there was another seat, she would probably be playing cards! Someone told me the Heritage Softail heats up a lot. When I hit Delhi, there were bad traffic snarls all over. There was some heating. But nothing to put me off. And if you ride this bike regularly, you do not need to go to the gym! We ended the day with 610 kilometres on the odo. In total we did close to 1500 kilometres. On fuel the bike clocked 21+ kilometres to the litre on mixed consumption. That gives us less than 5L to a 100 kms. Highly commendable for 103 Cubic Inch machine and for Indian roads where braking is more prevalent than anywhere else on the planet! But hey; let us not forget that if there is a lifestyle that the Harley represents in India, it is Royal. And we are looking to take this forward to a larger and bigger circle. A Big Thanks to the whole team! We thank Harley Davidson India for providing us the Heritage Softail for doing the Royal Lifestyle ride. We thank Maavalan Travels Pvt Ltd for all bookings and land arrangements during the entire duration. We thank elite blogging partners Journeyman Chronicles. A Big Thanks to the Deogarh and Rohet Garh management for extending us their entire support and making it one of the most memorable Odysseys. This was a Throttlequest.com venture. 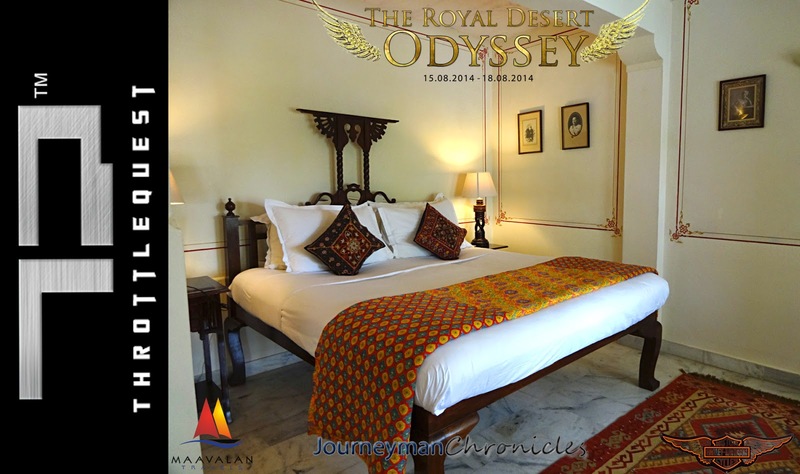 Item Reviewed: ROYAL DESERT ODYSSEY 2014, Final Part Description: Rating: 5 Reviewed By: Krishnendu, aka Ken.